With the appearance of a giant flower, it is a Perfect Plant Digimon that grew countless vines as roots from its body. Despite its strange appearance it is very docile, and due to its personality it rarely appears before others. For a plant it has an unusually long life span, and although the petals around its body (or face, really) fall out whenever the seasons change, it has the special ability to grow back new petals. It hates arid regions, and always inhabits areas near water. 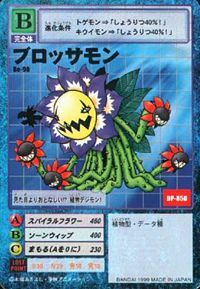 Its Special Move is hurling the tiny flowers growing from its vine tips like they were shuriken (Spiral Flower). These flower petals can cut through anything, no matter how hard. Perfect. 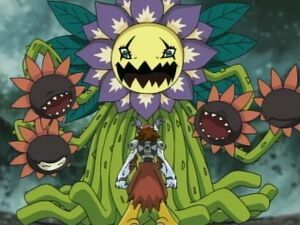 Plant Digimon. 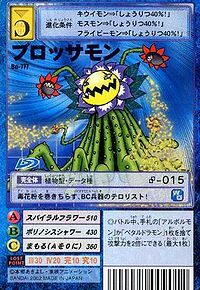 Its Special Move is Spiral Flower. A Perfect Digimon. 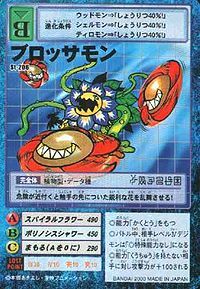 Its Special Move is Spiral Flower, it hurls its flowers as if they were shuriken, and cuts through anything, no matter how hard it is! n., From blossom 「ブロッサム Burossamu」, a group of varieties of tree flower. Anime/Manga Digimon Adventure: "The Dangerous Game! Pinochimon!" Spiral Flower  スパイラルフラワー Supairaru Furawā Throws bladed flowers at foe. Pollinosis Shower  ポリノシスシャワー Porinoshisu Shawā Sprays foe with poisonous pollen. Thorn Whip  ソーンウィップ Sōn Wippu Lashes out at the enemy with its thorny vines, or swings its vines to spread pollen. 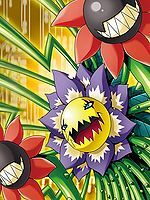 A Blossomon was one of the minions of the Dark Master Pinochimon. After being frustrated at not finding Takeru during their game, he kills several of his minions including Blossomon. 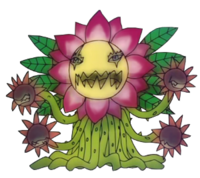 Archnemon creates a Blossomon from ten Dark Towers and sends it after Hikari, Ken, and Miyako who had accidentally gone to the World of Darkness. It fights them for a bit but is defeated when Hikari and Miyako's emotions unite allowing Tailmon and Aquilamon Jogress into Silphymon. 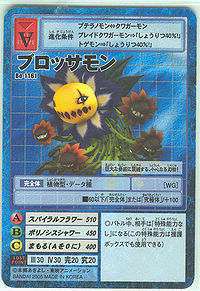 Blossomon is one of the Digimon that betrayed the X-Antibody Digimon to the Royal Knights. However, after dispatching the others Omegamon X-Antibody turns on her and the other normal Digimon. While the DATS team are exploring a mysterious house looking for a vaccine for Yoshino and Ikuto's illness, they are attacked by a Blossomon working for Gottsumon. It is defeated by Rize Greymon. 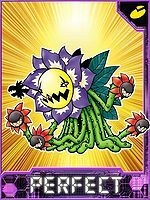 Blossomon is an obtainable Digimon. Evolves from Togemon (6-7 DP) and can evolve to Rosemon (0+ DP). Blossomon is an enemy Digimon. Blossomon is the first boss of the game and the first boss in Death Valley. Can be evolved from Vegimon if above level 24, or can be found at Pucket Mud. Blossomon is available as a Digimon Medal. Can be evolved from Togemon or Kiwimon with 4 or less calls, Win Ratio 40% or higher, Training 40+ times, Battle 30 times. 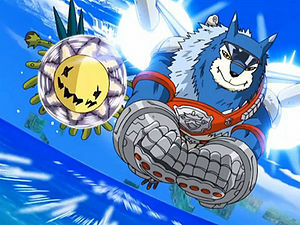 Can be Jogressed with a compatible Digimon to get Griffomon. Evolves from Bakemon, Gawappamon, Peckmon, Reppamon, or Starmon with Reliabililty 11-20, 0 DigiSoul. Can evolve to Barbamon, Jumbo Gamemon, Metal Garurumon, Ravmon, or Sleipmon. 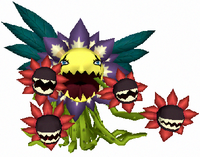 When danger approaches, it throws out the sharp flowers on the tips of its tentacles! It is actually more docile than it appears to be!? 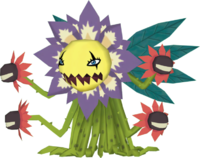 A plant Digimon! This biochemical weapons terrorist spreads toxic pollen! 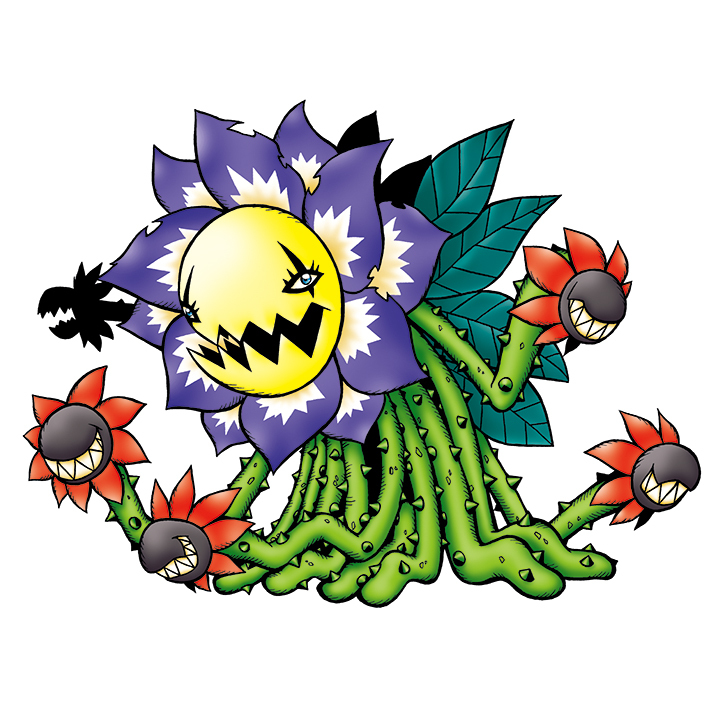 This cowardly bladed plant trembles at large threats! This page was last modified on 23 April 2019, at 01:10.